The Skinny: Chiu Yen-Ping = Usually Pretty Bad. This overdone prison flick can be an occasional diversion, but overall it's nothing worth seeking out. 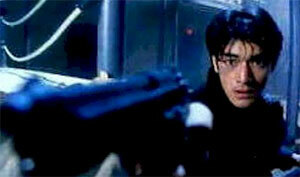 Takeshi Kaneshiro completists, be warned: he made many bad movies during the nineties. This wannabe Ringo Lam flick from Chiu Yen-Ping starts with some promise, but rapidly devolves into something only slightly above his normal fetid celluloid tragedies. Takeshi Kaneshiro is a jailed cop who ends up forming bonds with the likes of former boxer Nicky Wu and triad boss Lau Hok-Yin. Also among the prisoners is Ng Man-Tat as a rich inmate and some bespectacled, overweight actor who should be shot for his horrid overacting. Anthony Wong has a large cameo as the warden. At times, the film tries to be Shawshank Redemption crossed with Prison on Fire, but it’s too simplistic and poorly made to succeed. The drama is overdone and clunky, and sometimes borders on the embarrassing. More that wasn’t good: whatever complexity the film tries to mine with its discussion of black versus white is lost by the end, when everyone throws their principles out the window. Furthermore, the subplot of Anthony Wong’s evil warden only surfaces in the last twenty minutes, meaning that the previous eighty are free of the forces behind the films denouement.